Swiss-Vps Review 2019: Is Swiss-Vps a Good Hosting? As its name suggests, Swiss-Vps is a Switzerland-based supplier of VPS hosting plans that are proudly “Swiss Made”. Its Linux and Windows hosting servers sit on HDD or SSD storage. Founded in Switzerland in 2011, Swiss-Vps provides its proudly “Swiss Made” Linux and Windows hosting plans with HDD or SSD storage. Servers use Intel Xeon processors, and the hosting plans are backed up by a 99.9% uptime guarantee. The Swiss-Vps website can be switched between English and Russian. The lowest priced Linux plan includes 1 GB of dedicated RAM, one CPU core, 10 GB of SSD storage, and 1,000 GB of bandwidth. The entry-level Windows plan features 1 GB of dedicated RAM, four CPU cores, 30 GB of disk space, and 1,500 GB of bandwidth. Power-hungry customers can satisfy their hosting needs with one of several additional plans such as the SSD VPS8 Linux plan (with 8 GB RAM, 4 CPU cores, 50 GB SSD storage, and 3,000 GB bandwidth) or the top Windows-based plan (with 8 GB RAM, 150 GB storage, and 5,000 GB bandwidth). Depending on the type of VPS hosting, customers can choose from several different operating systems including CentOS, Ubuntu, Debian, LinuxMint, Scilinux, and Windows Server. Swiss-Vps uses a secure data center in Zurich, Switzerland, which is managed round-the-clock and protected against unauthorized entry. The network used by Swiss-Vps is connected to multiple upstream providers to ensure redundant internet connectivity. Swiss-Vps hosting plans are priced competitively compared to Swiss and international VPS web hosting providers. The entry-level Linux SSD VPS plan costs little more than many top shared hosting plans elsewhere. These plans are priced around 10-20% higher than what other top Swiss providers charge for similar features. VPS hosting plans can be paid for either monthly, quarterly, semi-annually, or annually, but there are no discounts for longer term lengths. At the checkout, you can choose paid add-on options to upgrade your operating system, bandwidth, control panel, or add extra IP addresses. Customer support is provided by telephone, email, or ticket system, and Swiss-Vps offers a “quick response guarantee” whereby it guarantees to respond to any customer request within six hours. I received no such rapid response (actually no response at all) when I reached out to sales support as a prospective customer. Maybe I shouldn’t be too surprised since this provider’s blog hasn’t been updated since 2014. 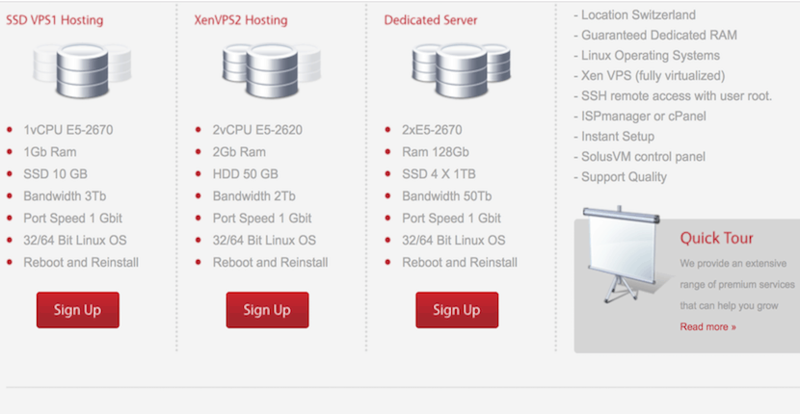 Swiss-Vps offers VPS hosting at competitive prices. Its Linux and Windows hosting plans sit on top of SSD or HDD storage, and they feature an uptime guarantee. Unfortunately, the “quick response customer support guarantee” didn’t live up to its promise for me as a prospective customer. See “Swiss Made” Linux and Windows VPS hosting plans at Swiss-Vps. Wondering how Swiss-Vps stacks up against other Web Hosting companies? Enter any other Web Hosting company and we will give you a side-by-side comparison.